These trees are very adaptable and well worth growing. With an average rainfall of 340mm (about 131/2 inches) per year, a number of species grow well in this region. While on holiday in western New South Wales last month, I found Brachychiton populneus growing in the area north of Lake Cargelligo. The rainfall there is about the same as we have here, perhaps a little more. They have a lovely dense spreading crown and are an attractive tree when not in flower. These trees are semi deciduous, losing their leaves just before flowering. This particular species has bell shaped cream flowers, blotched with red on the inside. Young leaves are tinged with pink. They are very easy to grow and tolerate a wide range of climatic conditions and soils. Although very drought tolerant, they appreciate water during the summer. This species is frost hardy. Because they are slow growing while young, they make excellent pot plants and are used for indoor decorations. 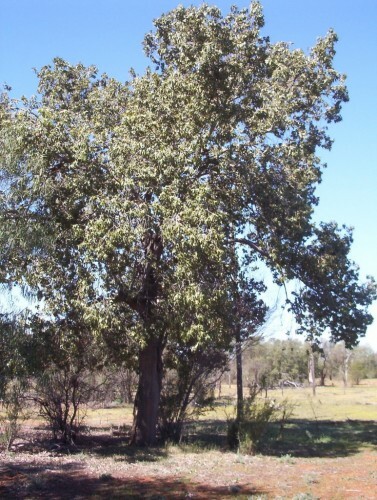 Good artical on the B.populeus.One subspecies I found is tall and narrow in its growth.Over 25ft tall and 10ft wide.The other more spread out and branchy.